· “U.S. 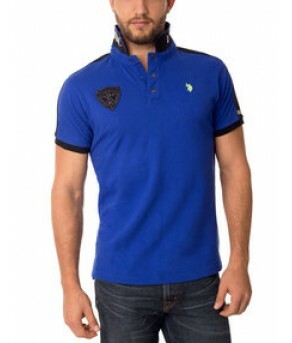 Polo Assn” printed under collar. · Small stitched logo on upper left front. · "New York City USA" patch on upper right front. · Small “U.S. Polo Assn.” rubber label on left sleeve. · Short sleeves with contrasting trim. · Contrast stripes on shoulders. · Vents at hem with contrast taping, back is longer than front. · Tailored cut for a slimmer fit.